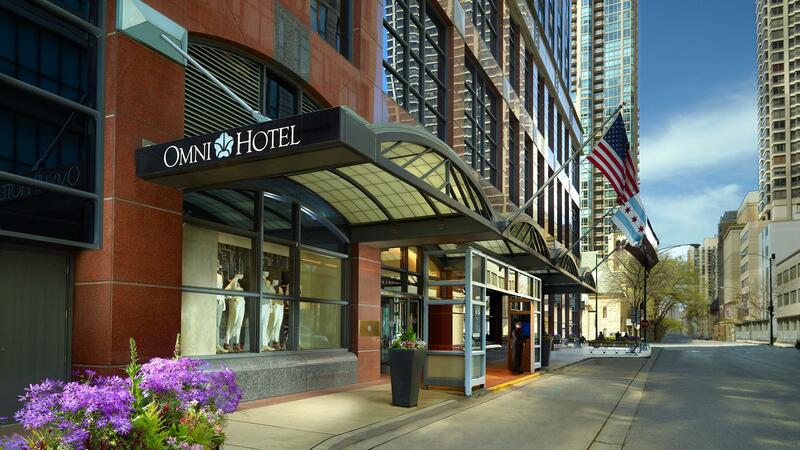 Rent Omni Chicago Hotel | Corporate Events | Wedding Locations, Event Spaces and Party Venues. Situated in the heart of Chicago, the beautifully renovated Omni Chicago Hotel soars 25 floors above Michigan Avenue’s famed shopping district and is the Magnificent Mile’s only all-suite, all-plasma-TV hotel. The hotel features 347 fabulous suites and 9 meeting rooms including the Chagall and Picasso ballrooms. With a total of 7,000 square feet of meeting space, the Omni Chicago Hotel is the ideal choice for business functions and events. It’s the day you’ve dreamed of since childhood, and now it’s finally here. Omni Chicago Hotel can help you make your wedding dreams a reality. With a prestigious address on Michigan Avenue in the heart of the Magnificent Mile, we'll meet your every need with attentive service, elegant banquet space and luxurious Chicago hotel accommodations. Omni Chicago Hotel is an ideal Chicago wedding venue for all your celebration needs: from engagement parties, bridal showers and rehearsal dinners to the perfect wedding reception and a farewell brunch. For all the moments of your treasured wedding day, make Omni Chicago Hotel your wedding site in Chicago. Omni Chicago Hotel features 347 fabulous suites and nine newly renovated meeting rooms including the Chagall and Picasso Ballrooms, as well our newest addition, the Van Gogh room, featuring floor-to-ceiling windows overlooking Michigan Avenue. With over 8,000 square feet of meeting space, our facilities are the ideal choice for board meetings, business functions and corporate events. Located in the heart of Chicago, our beautiful hotel soars 25 floors above Michigan Avenue and is convenient to nearby Fortune 500 corporations and businesses, McCormick Place and a famed shopping district.